This metaphor isn’t working. 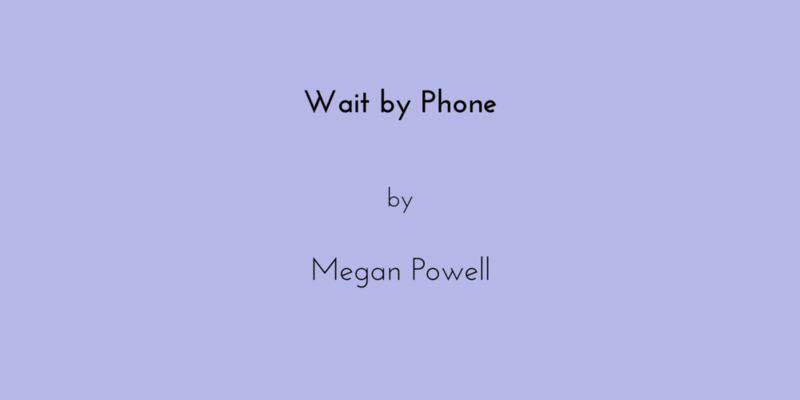 Of course, the advent of caller ID, not to mention the widespread usage of the cellular phone starting in the 1990s--has totally destroyed the brilliant efficacy of this metaphor of having to sit and wait by a phone. Who hasn’t sat beside a telephone waiting for that one call? That one call? Millions of people haven’t done it. This was a very theatrical and clever motif in which I would set this piece. Having to sit and wait by a phone that doesn’t ring, when you REALLY REALLY REALLY want it to ring. To ring. Not tinkle or fart raindrops or belch ZZ Top. And having to sit by it. This act signifies loneliness. Isolation. Stasis. Disconnection transformed to connection in mere seconds--and all the other kinds of anguish that make teenagers and adult women who are no longer in enrolled in any kind of school write terrible poetry. If you call me, you like me. If you call me, you love me. If you call me, I love me. If you call me, I like me. This metaphor--yup, yup--is OUTSTANDING. It’s going to WORK. I am going to use this anachronistic metaphor. Because, thank God, I have a couple of important English guys to back me up. It was Coleridge who coined the term “willing suspension of disbelief,” and Shakespeare really got it when he said: “tis your thoughts that now must deck our kings” (or phones). [Pick up phone. Check that it is working. This metaphor working, isn’t it? It’s not too…immobile, isn’t it? Waiting is active, right? Waiting is not wholly inactive but an act of being poised to act. It is not receiving but it is being…receptive. Receptive. This act signifies receptivity. Reception. Now, Derrida would argue that that words and signs can never fully summon forth what they mean—so the phone has no absolute meaning—only that which is produced from the systematic play of differences—“différence”, of course. This phone’s meaning is forever "deferred" or postponed through an endless chain of signifiers. Then, of course, it was Barthes who employed signifier as connotation, of bourgeois cultural myths—you know, the signifier, a bottle of beer is not just a bottle of beer, it’s relaxation. A phone is not just a phone, it is…it is...it’s… What was I saying? No. Nonononono. No. I’ve decided this is a metaphor for surrender. That’s a popular word nowadays. I have read Eat Pray Love. I know that surrender means more than what Cheap Trick meant what it means. And I am signifying this act of surrender by doing absolutely nothing but one thing. Because waiting by the phone means only one thing. And then when it does ring, are you ready for who or what is on the other end? Because you have to be ready. Want to see more of Megan’s work?